The parties are in privity of contract. 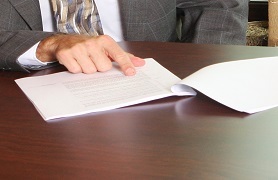 Additionally, for the covenant to be binding on subsequent owners, a purchaser must have notice of the covenant. This requisite notice can be “actual” or “constructive.” Constructive notice may be established by the proper recording of a prior instrument, typically a deed or lease, containing the restriction. In order to enforce the terms of a restrictive covenant, privity, a mutual or successive relationship in the interest of the real property must exist. Ohio law recognizes two types of privity for purposes of enforcing restrictive covenants: horizontal and vertical. Horizontal privity exists between the parties who mutually create a restrictive covenant. Vertical privity, which can be either “strict” or “relaxed,” exists when a subsequent owner’s successive interest can be traced back through the chain of title. In Ohio, strict vertical privity exists when the conveyance is an identical real property interest or by the establishment of strict continuity of title among parties. Relaxed vertical privity is established when the successor holds a lesser estate carved out of the estate held by the original party. Recently, the Ohio Fifth District Court of Appeals held that strict privity is not required in order for a covenant to run with the land. In BM-Clarence Cardwell, Inc. v. Cocca Dev., Ltd., BM-Clarence Cardwell, Inc. (Cardwell) and Cocca Development, Ltd. (Cocca) entered into an agreement that contained restrictions for the use of real property regarding the distribution of gasoline and the sale of groceries and/or alcoholic beverages as primary products. That agreement established horizontal privity between Cardwell and Cocca. Subsequent to entering into the agreement, Cocca leased the real property to Dollar General. The restrictive covenant, however, was not mentioned to Dollar General and its lease provided for the unrestricted sale of groceries. After that lease was executed, the deed, granting the real property from Cardwell to Cocca, which contained the restrictions, was recorded. Approximately six years later, Cardwell notified Dollar General that its use of the real property was in violation of the restrictive covenant and sought injunctive relief. 3. Dollar General had constructive notice of the restrictive covenant. The trial court found, however, that because Dollar General only had a leasehold interest in the real property, the standard for strict vertical privity had not been met. In other words, the trial court held that because the real property had been conveyed to Cocca in fee simple, Dollar General had not taken an identical interest, and therefore no privity of estate existed between Cardwell and Dollar General. The trial court ruled that because no privity of estate existed, the restrictive covenant was not enforceable against Dollar General. Cardwell appealed the trial court’s decision. In its review of the trial court’s decision, the Fifth District Court of Appeals found that strict privity is not required for a covenant to run with the land. Rejecting the doctrine of strict vertical privity, the appellate court found that the intent of the creating parties should determine whether a restrictive covenant runs with the land. Since Dollar General was a lessee of Cocca, a creating party of the restrictions, the requirement for relaxed vertical privity had been satisfied. In so holding, the Fifth District stated that an application of the doctrine of “strict” vertical privity would be inequitable because it would allow successive grantees of real estate to avoid compliance with restrictive covenants by obtaining a real property interest that is not identical to the estate held by the original party. Whether you are purchasing or leasing real property, the existence and effect of restrictive covenants are important to consider. For any questions you may have, please contact one of our real estate attorneys.